Attention Zombie lovers, on September 24th EPIX is hosting an all day celebration of the zombie sub-genre, across film, television, and literature, where luminaries from the field offer their insight and experiences. The experience centers around their new Doc of the Dead zombie genre documentary and an impressive roster of actors, authors, directors, and other well known zombie experts will participate in an interactive presentation, taking questions from the audience and talking about their experience. George Romero, Simon Pegg, Bruce Campbell, and many more will have an hour each to talk about zombies. What could be more fun than that? You can find the event Facebook here as well as more information on Doc of the Dead. Paramount, Lionsgate, and MGM get together to create EPIX as a modern multi-platform media channel, bringing their classics and hits to you through traditional cable TV methods, as well as VOD service from your set-top box, as well as streaming over the web. 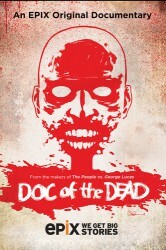 Doc of the Dead is an EPIX Original Documentary from the makers of The People vs. George Lucas that delves deep into the evolution of the zombie genre in Film, Television and Literature, as well as its impact and influence on pop culture. Featuring George Romero, Simon Pegg, Bruce Campbell, Max Brooks and many others. Posted by Bunni Fiver on Monday, September 22nd, 2014. Filed under Dark TV, Headline, Lifestyle. You can follow any responses to this entry through the RSS 2.0. You can skip to the end and leave a response. Pinging is currently not allowed.